The village Dolná Streda is situated in the Podunajská lowland on the right bank of the Váh river, near the town Sereď and for the first time is mentioned as Zeredahel the 28th August 1283, when the Hungarian king Ladislav IV. donated territory of the adjacent settlement Únovce to the Esztergom´s archbishop Ladomer. History of the village has its roots according to archeological findings in the era before Christ and proof of it there is a statuette, so-called “Venus” from Dolná Streda. Settlement is being witnesseth by burying ground from the 11th century. 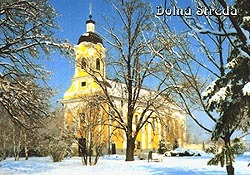 Formation and development of Dolná Streda together with adjacent Sereď had been determined by an important location of crossing of two historic roads: the first one had directed to the west-south-east from the Moravia throught Trnava, Šintava to Esztergom, the second one had led throught southern valley of the Váh river. Another bad event happened in the year 1312, when troops of Matúš Čák from Trenčín destroyed the village and the church burnt out. In the year 1553 the village is mentioned again as a rebuilt one probably after destructive Turkish incrusions. 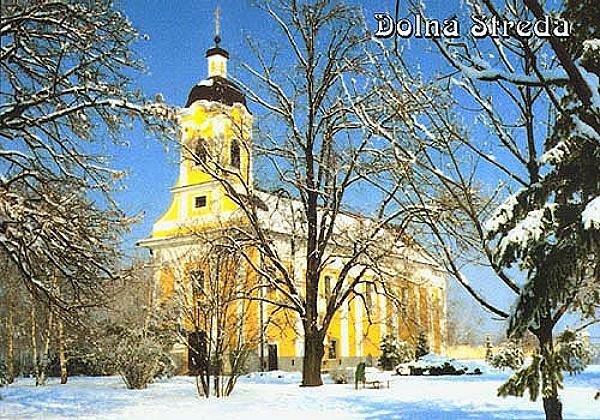 In the years 1571-74 it is written about Dolná Streda as an oppidum, that means, a small town with weekly and annual markets and with broad handicraft production. The village is mentioned as an important agricultural seat belonging to Trnava county of the Esztergom´s archbishopric. Many handicrafts were developed: basket-making, carriage-making, fence-making, weavery, pressing of hemp oil, tanneries. Development of the village was influenced by fishing and rafting. Here were born the caveman Ján Majko (inhabitant of the Domica cave), the poet Vojtech Mihálik. In this village lived ThDr. Ferdinand Juriga – priest and the first Slovak deputy in the Hungarian diet. Pride of the village was the singer of The National Slovak Theatre (SND) František Benkovský. Dolná Streda was well-known for its high level of amateur theatre and carnivals. In the year 1990 the village is separated and looked up. Proof of it is plynofication, water-supply, drainage, new lighting and broadcast, and pride of the village – park at the Kostolný place. Village dominant is the Baroque – Classicistic church finished in the year 1781, carrying the name of Saint Jacob and a lime-tree more than 100 years old. In the village were preserved traditional names of streets and needlework among many handicrafts. Almost 30 companies and businessmen in the terrier of the village represent Dolná Streda succesfully and thanks to this it has become an equivalent partner for the town Sereď and for the other important villages of this region. All this at the number of inhabitants 1256.